After the fun of the first meet-up, we did it again! 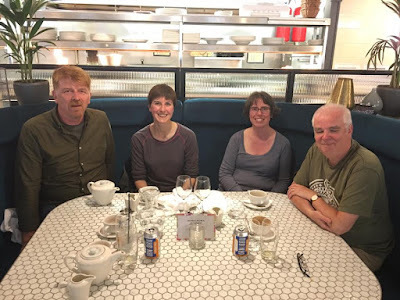 This time we headed west to Glasgow and had a great lunch at Browns on George Square. It was great to catch up with where everyone was at - when new books are coming out, what plans they all had. I'm still very grateful to Bloody Scotland for introducing us and for giving us the Spotlight slots almost a year ago. The Crime in the Spotlight initiative is running again this year - check out this year's authors who get their three minutes at the start of one of the sessions - full details here. I hope they all make as many new friendships as I have through the initiative.